In this guide I will show you a few ways to properly tame a Raptor! All About Megalosaurus (The Night Predator). How to Spawn Dinos (Console Commands). Guide for Beginners (Maps, Dinos, Cooking, Engrams, Recipes). How to Cure Swamp Fever Quickly. Step 1: Find a Raptor! First, you must actually have a Raptor to tame before trying to tame any. You can find lots of Raptors in the middle of The Island inward from the beaches, and sometimes on the beaches. They can also be found in the forest. On The Center they can be found at beaches, forests, plains, and basically anywhere else that isnt underwater or a cave. Once you have found a suitable raptor to tame, then you can move on to Step 2! Step 2: Re-locate or Immobilize the Raptor! This can be easily done since Raptors are quite small and can be picked up by pretty much anything except Pteranodon or Tapejara. You can use an Argentavis or Quetzal to carry the Raptor to a taming pen, or Kaprosuchus/Megalosaurus to drop it in a taming pen, or shoot it down while it is being held. Beware that Raptors can and will attempt to pounce on you, and if you have a small mount, they will succeed, possibly killing you and your tame. 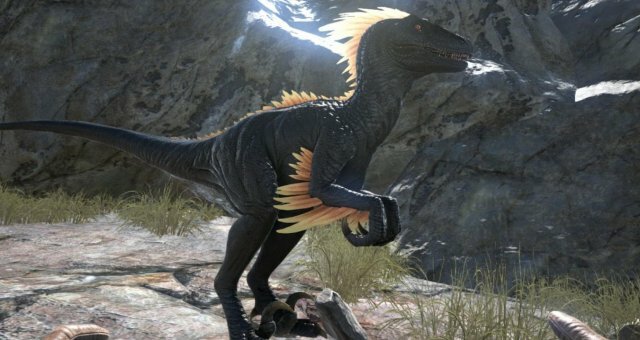 I recommend using a Kapro to kill off the other Raptors, then grabbing the one you want and shooting it down while it is still in the Kapro's jaws. This can be done by pressing the C (Grab Attack- Not Pounce) right as you are dismounting the Kapro. Using an Argentavis works too. You can drop the Raptor in a taming pen or have a friend/tribemate shoot it while it is still in the bird's talons. Also, if you do not have any of these things, a simple bola will work to keep the Raptor in place for 30 seconds, so quickly move on to Step 3 if you are using bolas! After your Raptor has been immobilized, it's time to bring out the tranqs! Use a bow or crossbow with tranq arrows or a longneck rifle with tranq darts. Beelzebufo, Equus, and Scorpion also work, just make sure not to kill it! Raptors have low torpor, and a level 120 can be brought down with 6-7 tranq arrows from an 100% damage crossbow. If your Raptor is not immobilized, be aware that when it's torpor gets high, it will flee, sometimes into the forest, making it almost impossible to find again. Using a bola can stop it for 30 seconds, so if it does try to run, throw a bola at it and shoot! Now that your Raptor has been knocked out, it's time to tame it! Raw meat works, but not very well, so use raw or cooked (raw is better) prime meat, mutton, or kibble if you want all the taming levels which will make your Raptor a lot stronger, and also will tame it much quicker. You must keep it unconscious though! Use narcoberries or narcotics to keep it down if the taming process is taking too long. Also, make sure NOT to damage your Raptor while it is unconscious, because doing so will lower the Taming Effectiveness AKA taming levels! Ok, so if you have tamed your Raptor, Good job! I hope you enjoyed my guide, this is my first one! I will leave you with a few ARK Raptor facts so you know everything you need to know about them! Raptors will pounce on you if they get the chance, and if there are 1 or 2 high level Raptors in a pack, there is a good chance they will kill you if you do not have a good weapon, mount, or guard dino! If you find one Raptor, there may be more! 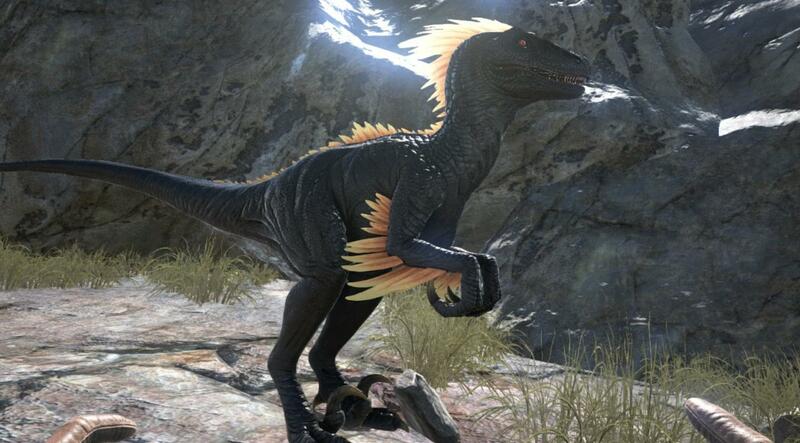 Don't just go up and attempt to tame/kill this single Raptor quite yet, make sure there are no other Raptors nearby. They almost always spawn in packs, and the only way there is ever really a single Raptor is if something killed off the rest! They are fast! Do not underestimate them! If you do not have high movement speed, they are faster than you! They are strong! If caught without a mount or guard dino, a pack of just 4 Raptors can quite easily kill a player with full flak armor and 500 health! Beware of tamed Raptors, because in packs they can do a sort of courage call, inscreasing damage throughout the entire pack! They make good companions/mounts! Having 1 or 2 Raptors around can be quite useful. They can guard you and your stuff as well as your other tames. They also make great companions when you are lonely.